This is Static Strike Progression dmg in this build. To explain why I choose it to max 18/12. 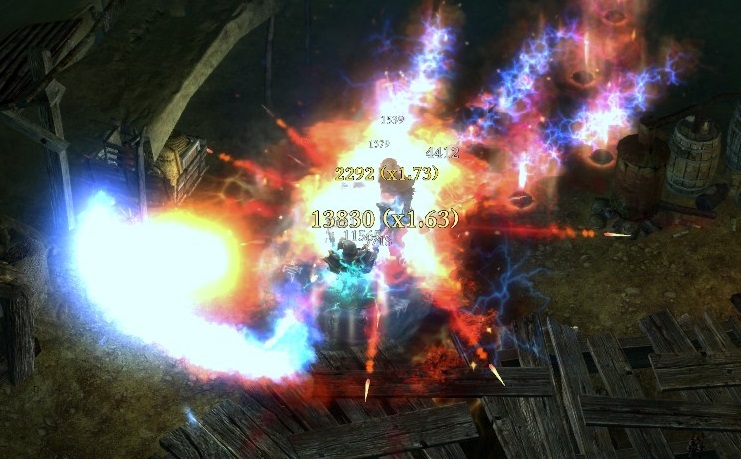 DW Pistols Sorcerer has been popular for a while due to good looking skills and easier to play. I'm the one who start to play sorcerer as a DW pistols in the first place too. I switch to play many caster build then has been recently back to gunslinger. So, I'd focus more in Fire&Lightning and more dmg source to compensate the loss dmg aside from pyro. Ulzuin's Set and Rings of Elemental Balance set were used. "Barrelsmith's Set without Grenado and Canister Bomb, I'm I high?" You can always use Devil Tongue+Exterminus. But I want to present a pair of good pistols other than ordinary. 3 strong WPS (10%, 10%, and 20%). All WPS has both hand weapon dmg. This can compensate low attack speed very well. These reasons make them worthwhile even not using Grenado or Canister Bomb. Why I don't use Grenado and Canister Bomb? Firestrike : Our main attack. Max Firestrike due to the most powerful in the line. Max Static strike because we've high lightning dmg. 12/12 Explosive Strike for most efficient. and fill the rest in Brimstone. BWC : 1 point of wonder and 1 point in transmute help reduced enemy physical dmg. Flashbang : Best CC against boss and mobs. I care about searing light because it's affect everything include boss. This build has many AoE around self. So confuse from flashbang isn't that necessary. IEE : I need only crit dmg from Elemental Balance. Mirror : 12/12 to lowest cooldown and works well with CDR. Immortal 3 secs is very good and we aren't invincible. So we often need it. Maiven's : Investment in Maiven should be 0/12, 3/12 or 12+/12. For don't care, efficien't lowest point or defensive. I find that this build may need 3/12 or 12+/12 because of being squishy. I found 3/12 is suit for the build. Inner Focus : I'd get 8/12, 10/12 or 12/12 for most efficient OA gain. I found 8/12 is enough. Nullification : Very good purge skills. 1 is enough for remove debuff on you and remove enemy buff. Useful when fighting with Madqueen and Cronley. Solael's Witchblade, Ulzuin's Torch and Fiend for Offensive purpose. Revenant for ADCtH because our build is rely on attack and weapon dmg. Viper for more OA and % elemental RR. Other is to fix and boost things like resistance and OA, DA, HP, Energy, attack speed etc. I consider Fabius and Iron Maiden to be the hardest trial in main campaign for ranged and caster builds. But my sorceress is with Kymon's. So I can only test with Fabius. - Madqueen : Use nullification when she activate her vengeance aura. Be careful of her attack which is really hard. Without Maiven or other absorption should be lethal if your HP < 7000. Keep Mirror when she try to hit you or it'll trigger your Mark of Divinity. Last edited by InkOsk132; 07-13-2017 at 07:16 AM. Wanted to make a guide for a similiar build, but you beat me to it. My build is a bit different tho. I have tested all pistols and came to a conclusion that Deviltongue + Exterminus is still the best combo with Deviltongue + Arcanum Sigilis being close second. - Attack speed coupled with some life leech and adtch is a cornerstone of a build survivability (along with capped movement speed and 80% slow resistance). 1. By the mastery and gear make sorc has relatively high OA itself. The more OA will come with more crit dmg build. I use high OA, crit dmg to present as a pros aside from pyro. With flashbang it can well. But I would remind that Flashbang is the best CC come from both searing light(50%) and itself(50%). - high lv of Flashbang : reduced enemies' DA(mean our OA is higher), up to 50% confuse rate on mobs(which is no affect bosses, but still very good as CC), and the large radius. - Searing Light : This will be shine when fighting boss and some mobs that don't get confuse. So even 2.3-2.4 OA sorc will be fine though. But again, if you don't have trouble with a large group of mobs that you can't clear fast or crucible. Stay Flashbang like 7/12 is fine(40% confuse). 2. Mirror -> it depends on how often you use it. And this build has 20% CDR which is high for non-caster. It make more sense so. During test with Fabius I used 2-3 Mirror for not fleeing and waste more time. And when testing with main campaign also use it some times when fighting with some boss or encounter serious fight. So I use Mirror frequently but not need all the time. So it not need Time Dilation for Mirror unless you're playing gladiator crucible. 4. As I said above. With WPS I present to compensate low attack speed. It's still good ADCtH and sometimes bursty life gain if both hands crit. I finished all content with my Gunslinger, including waves 140-150 in Crucible Challenger and only time I need my mirror is with Fabius. He is the only boss that gave me trouble, have to kite him quite a bit. But I guess I can respect points from Flash freeze to mirror just for fabius. But this is a flat fire. very small gains. Better sink it in Brimstone imo. Last edited by mad_lee; 07-12-2017 at 05:22 AM. For maxing dps you should use all sources of flat damage. Both Brimstone and FS in this case. Edit: oops, I didn't see InkOsk132 maxed only main skill. Last edited by korsar; 07-12-2017 at 05:25 AM. I'll fix Firestrike to 15/12 and Brimstone to 16/12. Thanks for polish it. I'm not sure about it. May test by 1 click, if 2 bullets out and there're brimstone on it. In that case it'll on top of FS. If not, it's replacing FS. Barrelsmith's procs are WPS. And as all WPS it isn't replace default attack, but upgrade it. Otherwise WPS would be dps loss.